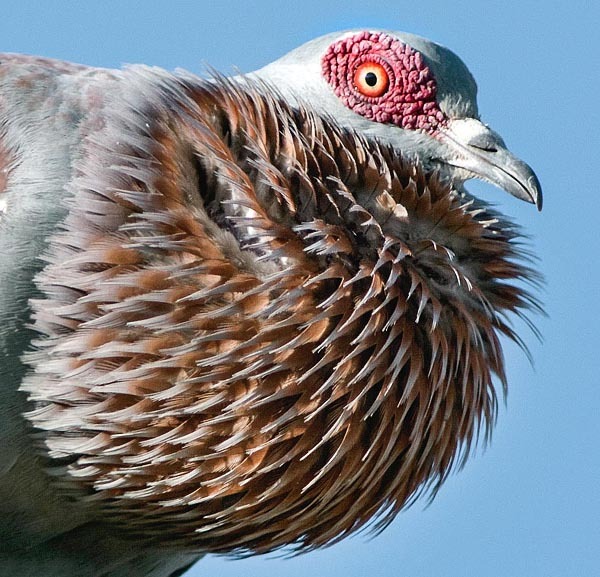 The Speckled pigeon, known also as Guinea pigeon or African rock pigeon (Columba guinea Linnaeus, 1758) belongs to the order of the Columbiformes and to the family Columbidae and is one of the species met more commonly in most of the African continent. Besides being very diffused in its territory, it is also a very visible bird as it merges the majesty of the shapes and dimensions, with an assiduous attendance of the inhabited places, the noisiness of its call and also one of the most brightly coloured liveries between all its congeners. By now this pigeon is always present in many African villages and cities and coexists peacefully with the human being even if many of them are usually victim of their own goodness, both in culinary and characterial sense.On the other hand besides being an abundant and palatable bite it is surely not easy for such a handy prey, to go roaming in places where the hunger often runs much faster than a bird! 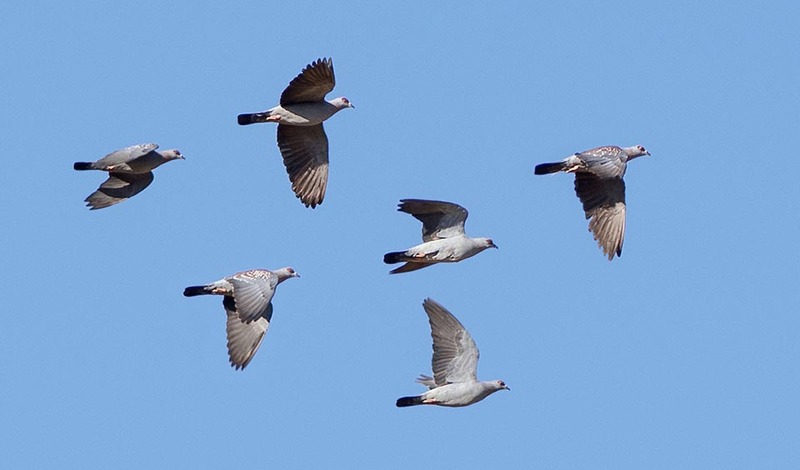 The etymology of the scientific name gets origin, for the genus Columba, from the eponymous Latin term that rightly means pigeon or dove, name coming in its turn from the Geek “kolumbus” that means diver or those that dive head down, just for the particular behaviour kept in flight by this bird during the courting. The species guinea comes from the place of origin identified by that time in that part of Africa generally called Guinea, though the first specimen carried to Linnaeus seems it was coming from Senegal. In the past centuries it was tradition to combine the name Guinea to all what was coming from western Africa or even from unknown and new worlds. Typical are some species of guinea fowls (Numida meleagris and Acryllium vulturinum) generically called in English Guineafowl. 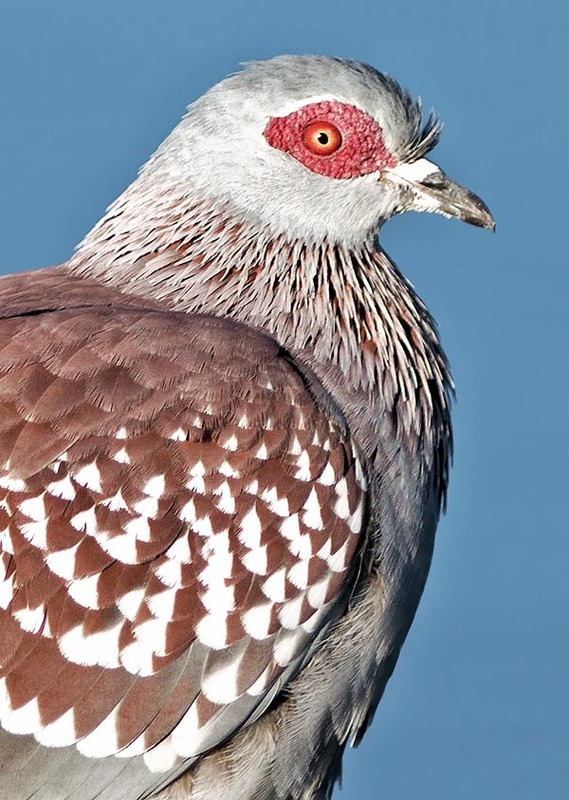 Some international names: in Italian, Colombo della Guinea or Piccione delle rocce africano; in English, Speckled pigeon; in German, Guineataube; in Spanish Paloma de Guinea; in French Pigeon roussard; in Portuguese Pombo da Guine and, nicely, in Japanese Urokokawarabato. Species native to the African continent, it is present in all the territory south of Sahara displaying in some areas a remarkable density and diffusion whilst in the mean time, in ample regions it results totally absent or rarefied. In particular the central-western area and part of the eastern one do not have inexplicably populations of this species, even if the habitats appear perfectly similar to the others or at least suited to their needs. From Angola to Mozambiqude is evident a territory not frequented even if just north of this band and even more accentuated south, the populations are ubiquitous and strongly diffused. The sub-Sahara belt from Senegal to the Horn of Africa, the Rift Valley up to Tanzania and densely the South Africa, are the most frequented areas. It is a sedentary species that remains persistently on the territory, except very short displacements while looking for food or for the evening gatherings in the common dormitories. 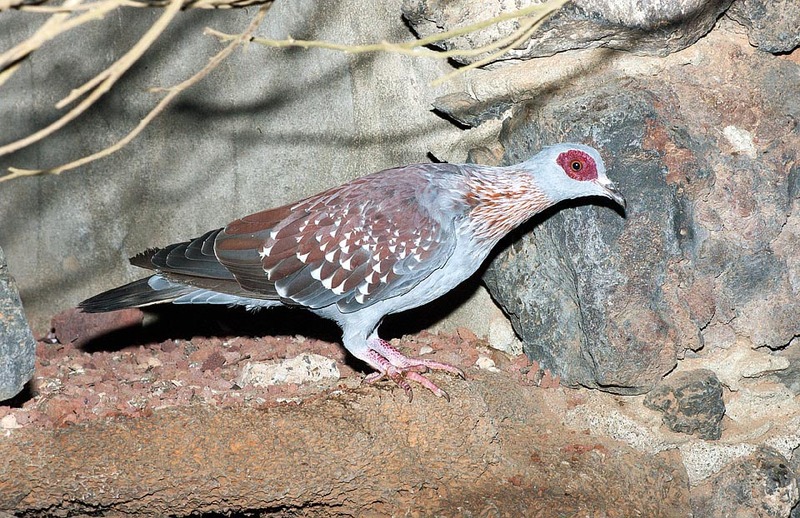 The behavior of this pigeon is very similar to that of our Rock dove or Rock pigeon (Columba livia) so much that it could be considered as its African equivalent, for the behaviour as well as the habitat it frequents. 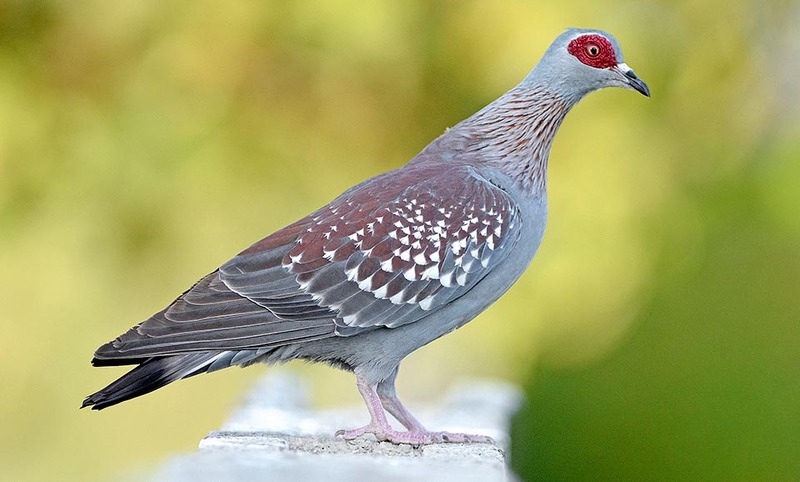 It is a pigeon of the rocks and of the mountainous or hilly areas, with ravines and overhangs, surrounded by sparse woods, vast clearings or savannah prairies but in the same time dwellings and human buildings, gardens and cultivated areas. It does not love the dense forests thus partially explaining the absence of populations in the dense equatorial forests of the western part of the continent, as well as the swampy zones or the marshes even if seasonal. Its habit to nest on rock walls has led it to accept the human constructions as if they ware such and therefore it has progressively conquered these new territories in a massive and continuous way. Besides being a reproduction place, the urban buildings have become also customary places for spending the night in common dorms, at times composed by hundreds of individuals. Then the introduction of massive and industrial cultivation, as occurred in South Africa, has led to an important diffusion and a progressive increment in their number, surely due to the greater availability of food. However, their habitat is quite varied and very different in the various occupied areas, thus proving a strong adaptability and tendency to accept always new environmental conditions. It is present from the sea level up to more than 3000 m of altitude in the Ethiopean highlands. 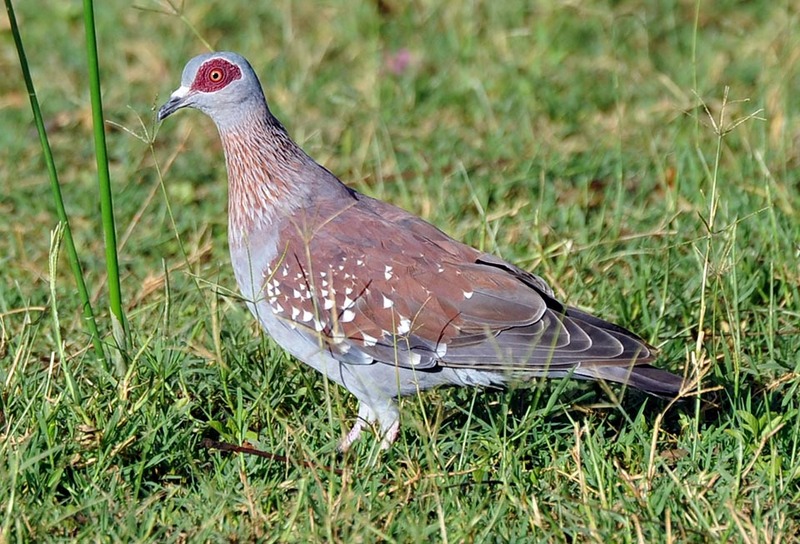 This pigeon has a very lively and attracting livery, easy to recognize also on the field. The dimensions are the usual ones for a big pigeon, a little over the average of the congeners. A size placing it between our Rock pigeon (Columba livia) and the Common wood pigeon (Columba palumbus). The length is of about 40 cm, average weight 350 g and wingspan up to 65 cm. Like all columbids, its has a strong and direct flight, with continuous and deep wing beats. These easiness of flight allows it to cover usually and without any difficultt, even tens of kilometres per day, for reaching the feeding or roosting locations far away from the nesting places. The predominant colours of the livery are mainly the ash grey and the purple wine colour, distributed in great part of the plumage and variegated between them with a measured pairing elegance. The chest, the belly, the primary remiges and the tail are of intense and compact grey colour. Also the head is grey but marked in the part surrounding the ocular zone by an ample spot of bare skin and corrugated of an accentuate violaceous red colour, one of the marks of identification more striking in this species. In the young this skin is greyish brown. The neck is elegantly variegated with the two livery basic colours, alternate vertical lines of violet and grey, forming an ample collar that unites as a ring on the nape. The back and the rump are violaceous, delicately dotted of white, but with a marked accentuation on the shoulder where these spots form more or less regular slight alar bars. Reddish legs, black bill with typical white crown on the front. The eyes have yellowish iris and strongly stand out in the aforementioned reddish spot. There is no evident sexual dimorphism excepting the dimensions in favour to the male whilst the young have a much milder livery in the colours and with less marked veins. Some subspecies have been identified even if others are still sources of debates. The Columba guinea guinea that occupies all the territory north to the Equator and going south in the eastern part, up to Tanzania, the Columba guinea phaeonota of the south-eastern part of South Africa and the Columba guinea bradfieldi present in the remaining part of South Africa and with some populations in Zimbabwe. 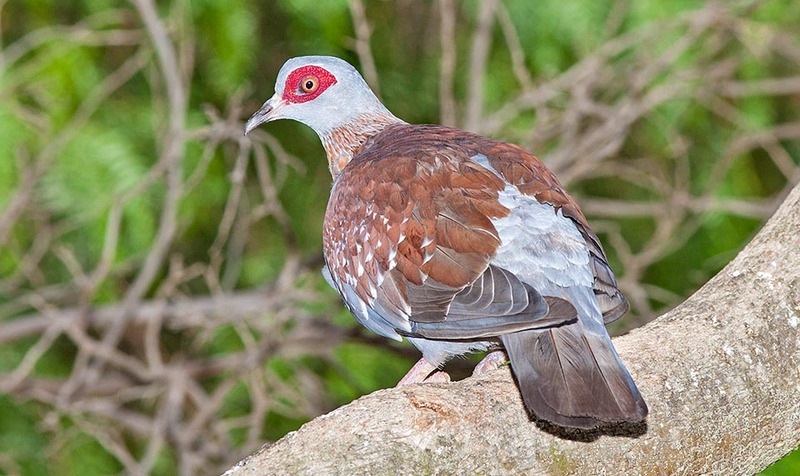 The speckled pigeon is a monogamous species only for the season of reproduction that may vary in the period depending the places and the latitude, so much to enable us to affirm that in some place of its vast territory, we can find nestings of this pigeon. The courting occurs with the same modalities of all the columbids in the world. The male coos insistently while turning around the female, inflating the crop like a sound box, to amplify and deepen the sound and to make it more vibrant. The song formula sees the emission of a series, endless at times, of four rapid “cu curù-cu curù-curù-cu curù” but also short periods of simple “duu duu duu” more muted and less insistent. The nest is a light structure built with twigs placed at the base that become increasingly slender to form a weak platform, built by the female but with material carried by the male. Outside urban areas the nest is usually placed in holes on rocky walls but always more often under the houses roof arches, gutters or niches in walls or on pillars. Like all columbids, it lays 2 white eggs, exceptionally three, rather round that are brooded by both sexes for at least 16 days. The just born chicks are nourished for the first week with the known pigeon milk, a milky secretion, predigested and highly nutritive that is regurgitated by the parents directly into the crop of the chicks. The weaning occurs immediately after with the direct input of seeds and grains less and less predigested and till the complete maturation and take off of the young, usually happening after about 30 days. They are very precocious birds and the sexual maturation happens after only 5 months from the birth. The Columba guinea eats mainly vegetable foodstuffs, eating seeds of any kind including the buds of the same cereals and wild fruits but does not fail to gobble, if it’s the case, small caterpillars or chrysalises hidden into the grass. This pigeon is object of predation by big sized falcons like the Lanner falcon (Falco biarmicus) and the Peregrine falcon (Falco peregrinus) as well as by some small eagles. Considered the vastity of the territory and the continuously increasing number of its populations, the species is not considered as endangered. → To appreciate the biodiversity within COLUMBIFORMES please click here.